September 30, 2017: By virtue of their victory at Nebelhorn Trophy, Penny and Nick earned Great Britain an ice dance spot for the 2018 Winter Olympics in PyeongChang, South Korea. Penny and Nick missed the entire 2016-17 season due to Penny’s shattered knee cap. The following articles detail her recovery and come back. February 21, 2016: Penny and Nick won the gold medal at Bavarian Open in Obertsdorf, Germany. November 14, 2015: Penny and Nick finished Trophee Eric Bompard in fourth place after the short dance. The free dance was not held as the event was cancelled due to the attacks on Paris. 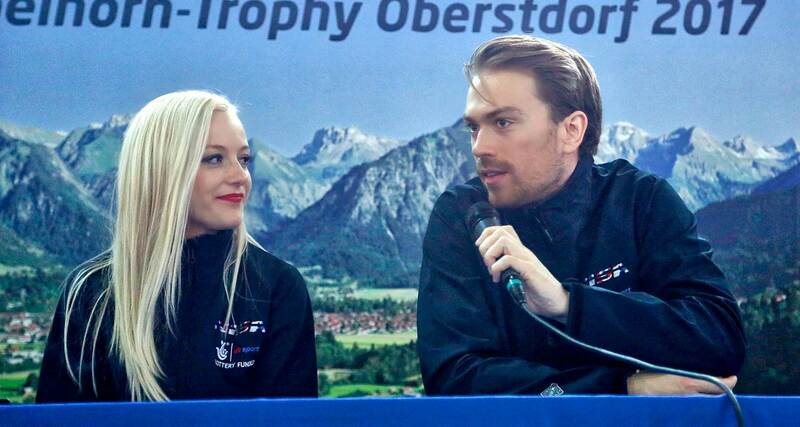 October 3, 2015 – Penny and Nick won the silver medal at the Ondrej Nepela Trophy in Bratislava, Slovakia. June 15, 2015 – Penny and Nick have been assigned to one ISU Grand Prix of Figure Skating event – Trophee Bompard. May 10, 2015 – Penny posted a note on her Facebook page detailing the end to their season (World Championships withdrawal) and their new coaching team. After a positive beginning, last season did not end in the way that Nick and I had hoped for. During our preparation for the World Championships I noticed that I was becoming more fatigued than usual, and within a few days I started to experience difficulty breathing. I continued training and doing what I could in the hope that I would still be able to compete. However about a week before we were scheduled to leave, my doctors in America took the decision out of my hands and said I wasn’t medically fit to travel to China and compete at the World Championships. Upon returning to England and working with my medical team here, I am now feeling a lot better and ready to start training again. After an abrupt and unexpected finish to our toughest season, we were faced with a difficult proposition. We were asked to move to Detroit to train with Igor Shpilband. As hard as it’s been for us all, we are looking forward to a fresh start and gaining a new perspective from Igor and his team. We are excited to start a new chapter of our lives tomorrow. We cannot express how hard it has been for us to leave Evgeny, nor put into words what he has done for us both over the past 5 years. We will miss him and our team in New Jersey dearly. Evgeny Platov has become, and always will be part of our family. November 15, 2014 – Penny and Nick won their first Grand Prix medal – a bronze – at Rostelecom Cup. November 13, 2014 – Europe On Ice posted a new article with Penny & Nick – Coomes and Buckland: “We need to reinvent ourselves”. October 18, 2014 – Penny and Nick started the season off strong with a gold medal at the Coupe de Nice competition in Nice, France. Winning the short and free dances, they scored 157.08 and their programs were well-received by the fans and judges.